GATE exam 2019 Full Detail Notification. This article give you detail information about GATE 2019 IIT Madras Notification, Exam Dates, Application Form, Eligibility, Education Qualification, Age Limit, Exam Date, Admit Card, Important Date And Links. This year 2019, Indian Institute of Technology (IIT) Madras will conduct GATE 2019. The official notification for GATE 2019 have released. Officially upcoming Graduate Aptitude Test in Engineering (GATE) 2019 will be conducted by IIT Madras. Last time in 2011 gate exam was conducted by IIT Madras. The online GATE 2019 will conduct tentatively during month February. GATE 2019 IIT Madras conducts 23 papers, candidates can apply for only one of the 23 papers. We all know that Gate 2019 is a national level post graduate entrance examination for admission to M.E./M.Tech and Ph.D. programmes at IITs, NITs and other Universities in India. If you will qualify this GATE 2019 with valid GATE score this will help you admissions in M.Tech, The score card will be valid for a period of 3 years from the date of announcement of GATE result for M.Tech admissions. GATE 2019 score, PSUs also use the GATE scores for recruiting candidates for various high level engineering jobs with attractive salary. The Indian Institute of Science (IISc) and seven Indian Institutes of Technology (IITs at Bombay, Kanpur, Kharagpur, Delhi, Madras, Madras and Roorkee) collectively supervise the conduct of GATE. GATE exams managed by a zonal GATE Office on the IITs or IISc. Educational Qualification: All of the candidates should have completed or be in their final year of Bachelor’s degree holders in Engineering/Technology/ Architecture (4 years after 10+2) (B.E./B.Tech) or Post-Graduate (M.Sc) degree in any relevant science subject. Qualifying Percentage: no minimum qualifying degree percentage for applying gate 2019 exam. Nationality: The candidates should be of Indian nationality but Candidates belonging to Bangladesh, Nepal, Sri Lanka, Singapore, Ethiopia and United Arab Emirates can also apply gate 2019. Application Fee: SC/ST/PwD/Female Candidates Applicants required to pay Rs.750/- and All other Candidates required to pay Rs.1500/- During Sept 1-23, 2018. And During the Extended Period (Sept 24 – Oct 1, 2018) SC/ST/PwD/Female Candidates Applicants required to pay Rs.1250/- and All other Candidates required to pay Rs.2000/-. International Students – Dubai and Singapore US$ 100, International Students – Addis Ababa, Colombo, Dhaka and Kathmandu US$ 50. The online application applies date form 01/09/2018 to 23/09/2018 till. Increase in application fee will be effective during the extended period, from September 24, 2018 (Monday) to October 1, 2018 (Monday). For more detail go to Official GATE 2019 website http://gate.iitm.ac.in/. Gate 2019 online apply registration process will be done through GATE Online Application Processing System (GOAPS). If any candidate fail to submit application form, they will not allowed to attempt the examination. We give the below full information how to fill or apply gate 2019. · Candidates have to register as a “New User” for GATE 2019 examination registration. · After successful registration candidates be able to access to GOAPS using their GOAPS Enrolment ID and GOAPS Password. · While filling GATE 2019 application form candidates need to upload scanned photograph, signature, thumb impression, degree certificate or category certificate. · The payment has to be done through online mode i.e., net banking/debit card/credit card. Correction of application form GATE 2019 will 2nd or 3rd week of November 2018. Certain amount of money will have to be paid for the changes made. Please note all detail will not open in Correction of application form GATE 2019. When candidate will apply GATE 2019 exam, the candidates will be able to select suitable exam centre. IIT madras will announced list of exam centre soon for GATE 2019. IIT Madras will be release the admit card for GATE 2019 in first week of January 2019. To download admit card use your enrolment number or email id and password. The admit card important gate 2019 if you not bring the admit card to the centre, then he/she will not be allowed to attempt the exam, also carry valid id proof. All detail exams date 2019 exams centre and other information will be available in gate 2019 admit card. IIT Madras will release the GATE 2019 official answer key will release in the third week of February 2019. This answer key help you check your correct answer and will help you to calculate GATE 2019 score. IIT Madras will be announced GATE 2019 result in March 2019, to download GATE result use your enrolment number or email id and password. The candidates who secure scores equal to more than the cut-off will be able to download their score card. Important Date of IES ESE Engineering Service Exams 2019. 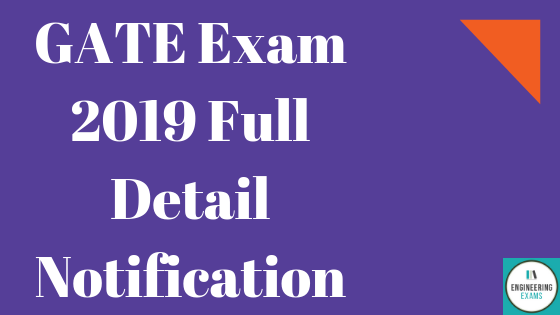 Below table I have provide you al important date IES ESE exam 2019. You can check below table.